What an exciting year this has been so far and it’s only October! I’ve definitely been a lucky girl in 2010. A romantic engagement in February, showers, lots of planning, a beautiful wedding in July, a fabulous honeymoon, moving into a new house and now? For starters, a snazzy new car! Do you love it? I do. 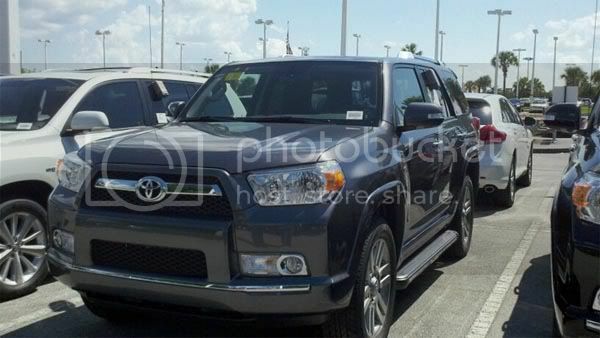 This 4Runner is a major upgrade from the little Mustang I’ve been driving for the last 7 years. It’s so nice, so roomy and so fun to drive. 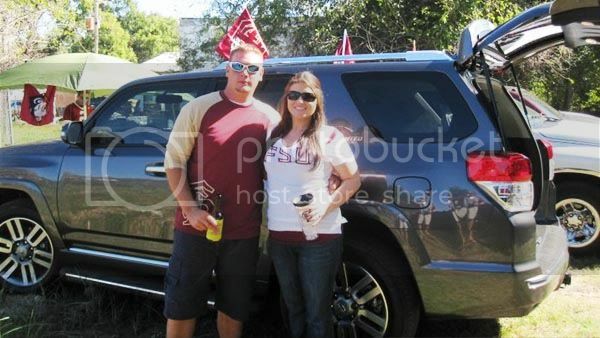 We even took it to the FSU game to test its tailgating abilities and it passed with flying colors. It will definitely be making many trips back with garnet and gold accessories galore. You might notice I look a little rounder and it’s not because I’ve been eating too many cheeseburgers. We have even bigger news to share: we’re having a baby! That’s right. We. Are. Having. A. Baby. Why not throw one more major life event into an already packed year? I guess that’s how we roll. Go big or go home. And I’m definitely getting bigger! Hunter and I found out the big news a few weeks after the honeymoon. I’m pretty sure I hadn’t even finished unpacking everything when I got “the feeling” and confirmed it with not one but four pregnancy tests! Hunter: Well, what does it say? Me: I don’t know. I think it’s a maybe. Hunter: What do you mean a maybe? Did you read the instructions? Me: Yes, but I’m not sure. There might be a light pink line, but it’s hard to tell. Is that a pink line? Hunter: It can’t be that hard to tell. (after a few minutes…) Hmm. It’s hard to tell. I think this one’s bad. We had to go back to the drugstore and get a set with a digital reading. Sure enough, it flashed “Pregnant” almost immediately. Since then we’ve been slowly sharing the news with our family and closest friends as I’ve been doing my best with the not-so-pleasant morning sickness. Unfortunately, it’s been bad and doesn’t end when the morning does. It comes and goes all day long for almost three months now. Aside from the nausea, everything has been pretty peachy and so exciting to think about what life will be like with a little one. What kind of parents will we be? What will the baby look like? It’s crazy! I’m way behind in learning to cook, clean and be a housewife so I have no idea how to catch up in that area and learn all about babies and motherhood, but I’m working on it! We’ve even had a few edible dinners lately that I’ve been responsible for. It looks like the rest of this year and next will hold more excitement, challenge and enjoyment than I ever imagined, but I’m really looking forward to it. New beginnings and new adventures with my favorite!